Clueless Gamer - Death Stranding anyone? As a big fan of Conan O’Brien, I was excited when I found out that he was going to Japan for his show. His ‘remote’ episodes have always been some of his best (just look up Conan in Italy on YouTube), and his Japan trip promises to provide tons of laughs. But something happened during his trip that I totally did not expect. I almost spilled my drink when I saw this tweet, as it’s something I definitely did not dream of happening. Sure, Conan does have his funny Clueless Gamer series, but I didn’t expect him to work with Kojima anytime soon. In Kojima’s tweet, apparently Conan dropped by and had a tour of the Kojima Productions office where he signed “Can I have a job here?” on the office’s kitchen wall. 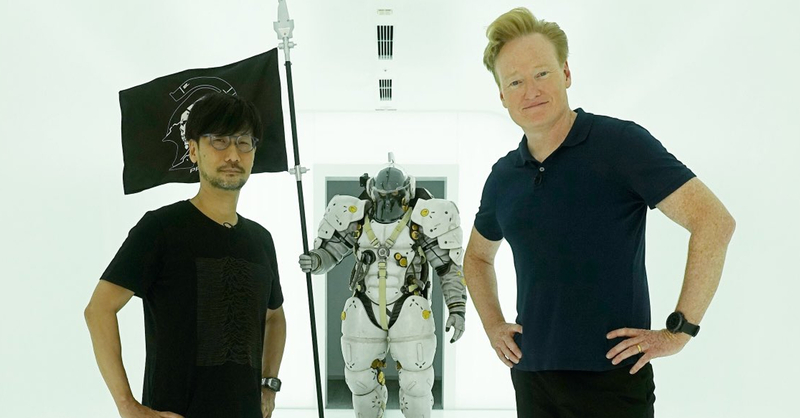 The next day, Conan himself tweeted a pic with Kojima with the caption “shot something super secret.” Does this mean we’re getting a Clueless Gamer – Death Stranding edition? I surely hope so! Or what if Conan will have a cameo in the game itself?! Whatever the case, Conan X Kojima might mean that KojiPro is ramping up Death Stranding promotion. This is making us even more excited for Tokyo Game Show this year as Kojima will be presenting the game at TGS 2018! Next articleSquare Enix’s Left Alive is Every Mecha Fan’s Dream!